A man is handcuffed and taken into custody by police during the raids. Six people have been arrested after police carried out early-morning raids in a bid to combat a suspected organised crime group. Operation Marsa saw Northumbria Police officers, supported by the North East Regional Special Operations Unit (NERSOU) and the Dog Section, carry out drugs warrants at six addresses across South Tyneside, including in South Shields and Boldon, on Wednesday. Cash and drugs were seized, along with mobile phones and other technological devices. The force said the warrants were in response to information about a suspected organised crime group believed to be involved in the distribution of drugs across the region. Five men and one woman were arrested on suspicion of drug-related offences and taken into custody to assist police with their enquiries. 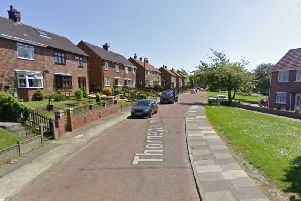 Detective Chief Inspector Michelle Robson, of Northumbria Police, said: "This week’s activity reinforces our commitment to tackling suspected organised crime and drug dealing in South Tyneside. "We are aware of the harmful impact drugs and drug dealing has on our communities, so we will continue to look to protect vulnerable people from being drawn into the vicious cycle of drug use and criminality. "We are committed to tackling drug dealing across the region, and by taking positive action we can disrupt the activities of organised crime groups and identify suspected offenders. "Anybody involved in this kind of harmful activity can expect to be pursued by police, as we look to make our communities safer." The six people arrested as part of the operation have since been released on police bail pending further enquiries.